William Kidd was born in Dundee, Scotland in 1654, in the Cromwell era. After his father’s death he went to sea, and before long Kidd was a successful privateer and merchant captain, well regarded and married to a wealthy New York widow. Riches did not materialize on schedule. After more than a year at sea the Adventure Galley had taken no prize, and since no capture meant no payday, the crew – many of them former pirates themselves – were angry. Kidd pushed on, hoping he could bring in enough gold to make up for being past deadline. A few skirmishes and small captures didn’t help distract the men from their lousy prospects, and a fight eventually broke out between Kidd and the Galley men, led by gunner William Moore. The crew wanted to take a Dutch ship they suspected to be especially rich, and Moore suggested they kidnap the crew, loot the ship and make everyone sign a letter stating the capture was legal. Moore goaded the crew by grinding a heavy chisel; Kidd called Moore a lousy dog. The argument ended with Kidd hitting the gunner over the head with an iron-ringed bucket, and he later died as a result of the wound. Thankfully for Kidd and the crew’s morale, the Adventure Galley soon captured two fat prize ships, Armenian-owned vessels sailing under French paperwork that verified them as legal capture. Kidd stashed away the French passes and may have breathed easier had his crew not soon voted, 100-15, to mutiny over to the ship of known pirate Robert Culliford. Kidd went home, where three years without solid news had many Englishmen – especially the ones with skin in the game – wondering: where had he been all this time, what was he really doing, and who was paying for it? Out of concern that Kidd would be tried and executed while Parliament was on recess (and before the politicians could cover the appropriate bums), the legislature asked to postpone trial – so after eight months in Boston prison, Kidd would spend about a year more in Newgate prison uncharged and without the conveniences that would normally be afforded a man of his station. In 1701 Kidd was finally called before the House of Commons, which eagerly hoped that he might denounce one of the noblemen and say that he was encouraged to be a pirate. He denied any act of piracy and the case went on to trial of six counts: a murder charge for the death of William Moore, and five counts of piracy. Image linked via the Law Library of Congress. Kidd finally received his papers from the Admiralty, but he found that his French capture passes and the letter from Bellomont mentioning pardon were mysteriously missing. In the murder trial, Kidd explained that he had been provoked by Moore in the face of mutiny, and had thrown the bucket never intending to kill the man. (Ordinarily a finding of mutiny and provocation would excuse such an act.) A crew member testified that there had been no mutiny, and the ship’s surgeon said that Moore had died as a direct result of the wound inflicted by Kidd, though he did not see the incident, and even as Kidd insisted the doctor was drunk below deck for most of the voyage. After one hour the jury returned a guilty verdict. On the remaining piracy counts – at this point unnecessary given the murder conviction – the court chided Kidd for failure of his duty to produce documents of capture. This was especially harsh since the Admiralty and House of Commons both had seen the passes and knew they existed. William Kidd was hanged on May 23, 1701 at Execution Dock. Custom held that pirates’ bodies were to remain tied to a post in the river until the tide had washed over them three times. Kidd’s body was then hung in an iron cage from the gibbet at Tilbury, dangling at the mouth of the Thames for incoming ships to see. Despite poor legal procedure even by 18th century standards, most scholars claim that justice was nonetheless done. Advocates for Kidd have emerged with time – most recently Richard Zacks, whose lively, thorough 2002 book The Pirate Hunter tried to show a different picture (legitimate sailor done in by a mutinous crew and the betrayal of his financial backers). Shady accounting: the parties’ contract stated that enemy ships would go through Admiralty court as was typically required, but pirate goods were to go directly to Bellomont with no accounts to be made to the Crown. Basically, Kidd’s backers were taking the risk of bringing in pirate goods under the table, no questions asked. If Kidd’s going AWOL brought unwanted attention to that fact, the lords could be in hot water for going behind the king’s back. Why else would Kidd’s partners turn on him? Bellomont could either attempt to clear Kidd’s name and run the risk of publicly labeling himself a pirate sympathizer or a whitewasher, or he could paint himself an assertive patriot crushing pirates for the good of England. Gossip in England and the colonies intimated that a “corporation of pirates” had been formed by the King and a handful of lords. Plus, one of the captured ships was apparently distantly tied to the affairs of the powerful East India Company. The backers were no doubt very nervous. In fall 1697 the crew looted a ship called the Mary while Kidd was in conference with its captain Parker. Richard Zacks’ research uncovered the testimony of five Portuguese monks aboard the Mary, which states that when Kidd realized what had happened in his absence, he angrily made his crew return what they had stolen from Parker’s ship. Go right to the source with The Tryal of Capt. 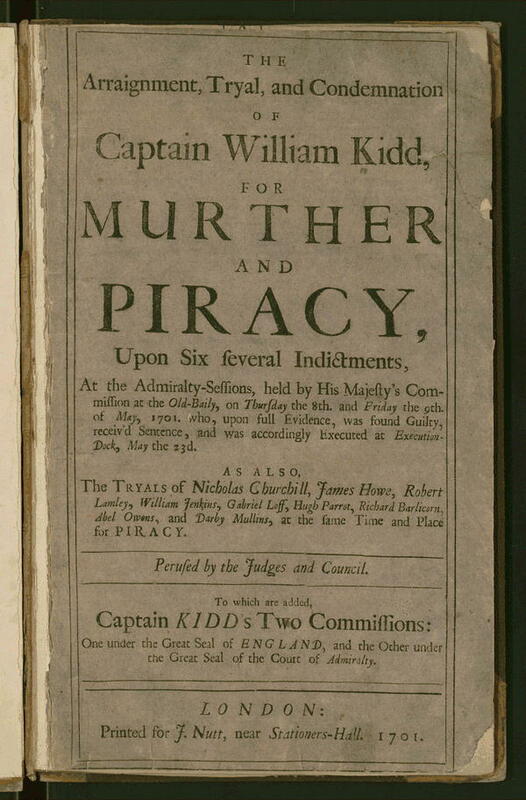 William Kidd for Murther and Piracy (1701) – also readable in the original, courtesy of the cool piracy resources at the Library of Congress! Historian David Cordingly’s popular Under the Black Flag is a fun read. One of Kidd’s first modern advocates was Richard Zacks, writing in The Pirate Hunter. * Captain Charles Johnson, A General History of the Robberies and Murders of the Most Notorious Pyrates (1724). This book is almost as well-known for the conflict over its authorship as for its content. For many years Daniel Defoe (of Robinson Crusoe fame) was credited with having written the work under the pseudonym of Captain Johnson, but more recent research has come to discount Defoe as the author. It’s still regarded as a go-to source on the so-called Golden Age of Piracy and part of the legend-making of men like Kidd and Blackbeard. ** Articles of Agreement, Made the 10th Day of October, in the Year of Our Lord 1695; Between the Right Honourable Richard Earl of Bellomont on the one part, and Robert Levingston Esq. ; and Captain William Kid, of the other part. 18th century jurisprudence was flawed, but the distinctions between pirates and privateers remains a tenuous one, owing more to the crown’s tax rules than to any distinctions of behavior. Agreed! The difference between pirate and privateer is at best a semantic distinction, and privateers were known to bend the rules of their letter of marque as far as they often could (and beyond if no one was looking).